Pilgrimage to Tirupati is incomplete without a visit to Sri Padmavati temple at Trichanoor which is about 5kms from Tirupati. There is a beautiful temple which is dedicated to Padmavati. Trichanoor is also known as Alamelumangapuram (or Alivelumanga Puram) is a small town near Tirupati, the famous pilgrim center of the Hindus. Sri Padmavati is the divine consort of Lord Venkateswara. As Goddess Padmavati, a manifestation of Goddess Mahalakshmi had risen from Padmam mean lotus flower. Goddess Lakshmi gave darshan to Lord Venkateswara on a red Lotus flower in Padma sarovar lake at Tiruchanoor after his deep penance for twelve years. At Tiruchanoor, Goddess Mahalakshmi is worshiped as the main deity. An inscription in the Padmavati Temple tells you in detail about the history of Tiruchanoor. 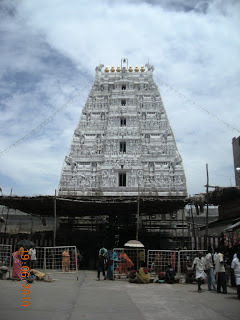 Originally there was a temple in Tiruchanoor that was dedicated to Lord Venkateshwara. It was difficult for the priests to perform all the religious rituals because of space shortage. So they decided to carry out the activities elsewhere and only two important ceremonies were performed here. Later even this became difficult and so the place of worship was shifted. The place eventually lost all its significance. In the 12th century, the importance of the place was partially revised when the Yadava kings built the Shri Krishna Balaram Temple over here. Much later in the 16th and 17th century, two additions were made. The deity of Sundara Varadaraja was installed and a separate temple was built for Goddess Padmavathi. According to mythology, she was born in a lotus pond which is actually the tank within the temple premises of Tiruchanoor. Sri Padmavati Ammavari temple, Tiruchnur is just 5 kms away from Tirupati. Buses from Tirupati available for every 30 minitues. You can reach here by your own vehicle or public transportation like bus or auto-richshaw.